Suspect wanted for robbery to a business. 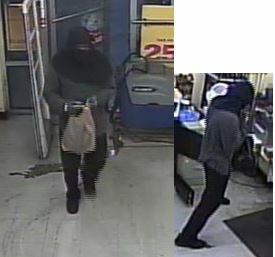 A masked suspect entered Family Dollar, jumped the counter and demanded cash from the clerk then fled on foot from the business. The suspect was described as a black male, approximately 5’11”, thin build, wearing a green or gray long sleeve shirt, black pants and black shoes. This incident occurred on August 1, 2018. Family Dollar is located in the 1200 block of S. Dixie Highway, Lake Worth. ← The Palm Beach County Sheriff’s Office is seeking the public’s assistance in a “Hit and Run” traffic crash investigation.